DJ Vinnie Esparza has been a fixture on the San Francisco DJ circuit since 1994. As a resident of a long list of parties including Hella Tight, Free Funk Friday, Dub Mission, Colombia!, Olde Soul, No Categories, Kojak, New Conception and Soul Samba, Vinnie has always spun diverse sets ranging from soul, funk, jazz, Afro-Latin, bossa nova, reggae, and club beats. His primary goal during his sets is to strike a balance between playing to the crowd and exposing his audience to new sounds and genres they were not even aware they liked. Unless otherwise requested by a client, his sets attempt to connect the dots between all of the genres mentioned above. Vinnie is the DJ to contact if you seek a classier, more sophisticated sound with popular crowd pleasers sprinkled throughout. Born and raised in Oakland, California and now residing in San Francisco, Vinnie began his career in music at college radio station KZSC in Santa Cruz, California where he served as Music Director, a member of the station governing board and on-air personality between 1990-1994. He was named “College Music Director/Program Director of the Year” by Gavin Magazine in 1994, and subsequently went on to serve as Co-Editor for the magazine’s college radio section. He has also worked with Ubiquity Records as their Director of Promotion and Publicity when the company was still based in the city. Vinnie has had the honor and pleasure to open for such acts as Tito Puente, Jamiroquai, Lee Perry, Bebel Gilberto, Mongo Santamaria, The Meters, Jimmy Smith, Eddie Palmieri, Sharon Jones and the Dap-Kings, Scientist, Brother Jack McDuff, Greyboy All Stars, McCoy Tyner, Lee Fields and The Abyssinians among others. Besides his DJ work, Vinnie is co-owner of Dis-Joint Records and helps run the world famous record store Groove Merchant Records. And yes, he still spins vinyl records. • Winner of the San Francisco Bay Guardian's "Best Of The Bay" readers poll award in 2000. • Winner of City Search's "Best Of" award. • Nominated for 2001 & 2003 SF Weekly "Best Of" award. 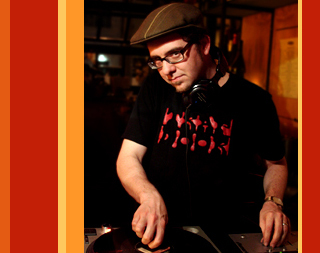 • First DJ to be invited to spin at the legendary Monterey Jazz Festival in 2007, and again in 2009.